Nothing like a cold glass of Sauv Blanc and a walk through the lavender fields. Located in a rural area of Santa Rosa on a Bennett Valley Estate. Midway between Sonoma and Santa Rosa. Open Daily 10:00 to 4:30pm. The lavender mural in the tasting room is GORGEOUS. 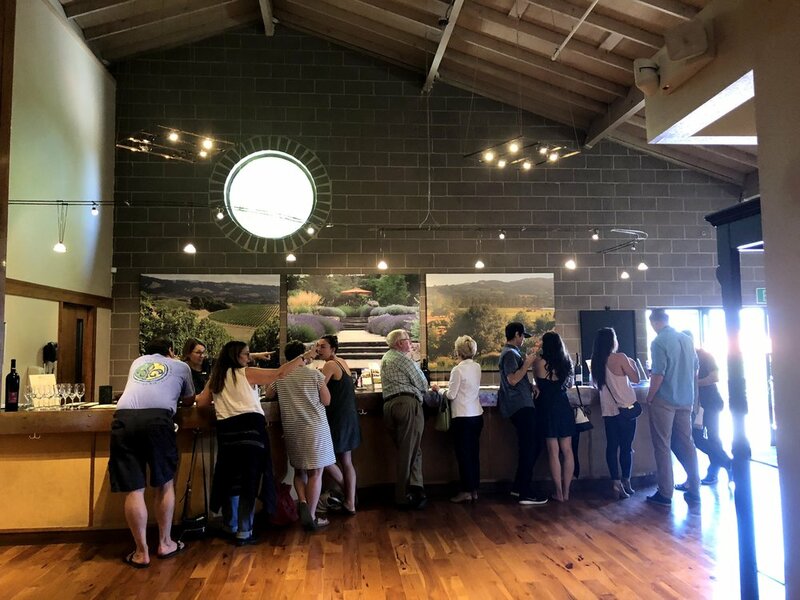 Tasting is $15pp, five pours, tasting fee waived with 2 bottle purchase. Kid friendly and dog friendly (leashed). Bring your own food and picnic in the garden. A glass of wine or bottle for picnic is available for purchase. Tables/chairs are scattered under trees or in the sun looking out on the lavender..
Family fun on the Bocce ball court or playing corn hole. Their Journey Reds are more expensive. 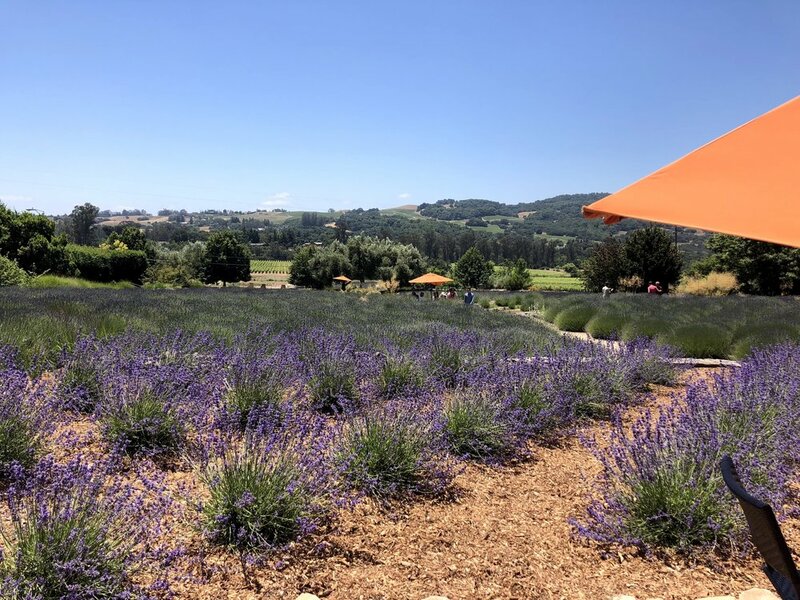 In 1991 the terraced lavender gardens were planted at Matanzas Creek. Bath, body and home products. More than 2 million stems are harvested every year. During peek lavender season expect chaotic crowds, so bring your patience. paint, photography, honey bee classes and more! I have an annual tradition of visiting these lavender gardens in late June. The magical smell and vibrant purple color of lavender enchants me! There is something very Parisian about this experience. I highly recommend popping into the Lavender Market. Picking up a lavender treat is a must every time I visit. This year I went for the Lavender Spa Spray. Lavender scent mixed with a hint of mint and vanilla. Reminds me of Bath & Body Works holiday scent, Twisted Peppermint, minus all the chemicals. 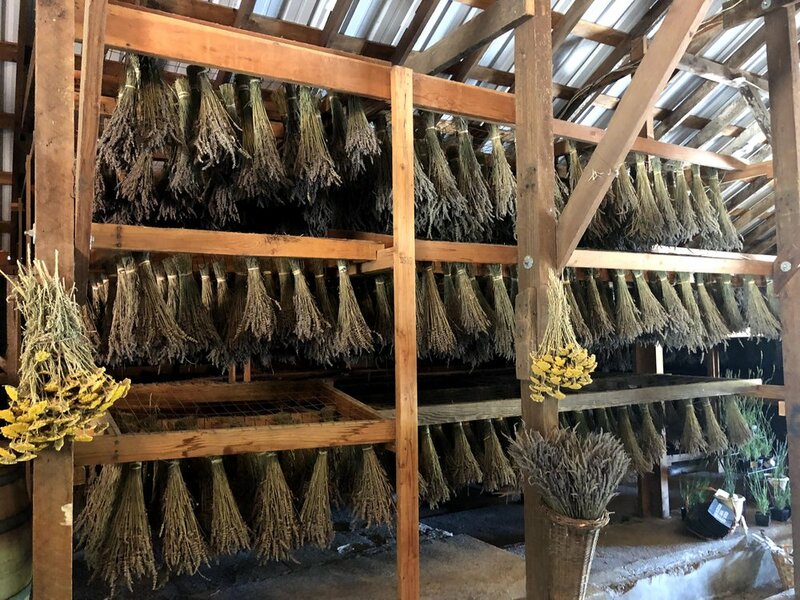 It’s so neat to see lavender drying and hanging from the barn. Lavender has this ability to eliminate nervous tension, relieve pain, enhance blood circulation, and treat respiratory problems. The combo of lavender relaxation and a glass of Sauv Blanc is PERFECTION!